New Look Emilee Overbump Maternity Jeggings Size 10. Gap Maternity Blue/white stripe stretch wide leg trousers US6/UK10 with belt detail. Deep pockets. Super comfortable. Have a nautical relaxed feel about them. Condition is Used. Seraphine Black Maternity Trousers Size 14. Condition is Used. Dispatched with Royal Mail 2nd Class. 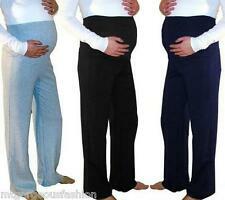 Asos Sample Maternity Loungewear Bottoms Size 10. Under bump,wide leg. Approx inside leg 32". Stretch jersey, elasticated waist. Sample label attached. Beige and ivory print. Black under bump maternity work trousers by ASOS. Inside leg - approx 28", size 12. 73% polyester, 20% viscose, 7% elastene, machine washable. Asos Sample Maternity Jogger Bottoms Size 10. Turquoise with pink side stripe. Under bump,straight leg. Approx inside leg 30". Sample label attached. Cotton poly jersey. Mothercare Maternity smart Trousers Size 8 in good condition. These have been altered well to fit a 27” Inside Leg. Also a circle patch near the bottom of the leg as shown in pics. Hardly noticeable. NEXT Maternity Skinny Leg, Over Bump Trousers Metallic Gold. Size 12.